Cobblers defender Leon Barnett retired from playing football due to a heart condition. The 32-year-old hasn’t featured for Town since the 0-0 draw with Bury on October 2, which was Keith Curle’s first game in charge of the club. The centre-back felt there was an issue during that encounter, and after undergoing tests following the match, the heart condition was discovered. Barnett has since sought the opinion of three specialists, and following further tests he has has been advised not to continue with his playing career. The professional medical opinion is that it would be unsafe for him to continue training and playing. 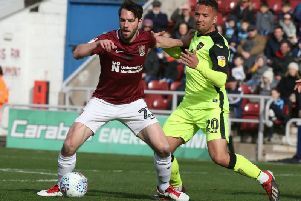 Barnett joined the Cobblers in the summer of 2017, being signed from Bury by Justin Edinburgh on a free transfer. His time at Sixfields has been interrupted by various injuries, meaning he only made 22 starts and two substitute appearances for the club. Barnett scored one goal for the Cobblers, in a 2-2 draw at Southend United last season. The Stevenage-born player began his career at Luton Town. He made his debut for the club as a 16-year-old, and after impressing over a five-year stay at the Hatters was sold to West Bromwich Albion for £2.5 million, and he helped the Baggies to win promotion to the Premier League. He spent four years at the Hawthorns, and loan spells at Coventry City and Norwich City followed, before he joined the Canaries on a permanent basis, going on to again play in the Premier League for the Norfolk side. Barnett enjoyed a short spell on loan at Cardiff City, before leaving Carrow Road for Championship side Wigan Athletic. While at the Latics, Barnett played in the Europa League, with Wigan having qualified for Europe following their shock FA Cup triumph the previous season. Barnett spent three years at the DW Stadium before joining Bury, and after one season at Gigg Lane he made the switch to the Cobblers. In all, Barnett made 320 senior starts and 36 substitute appearances in his 16-year playing career, scoring 16 goals.